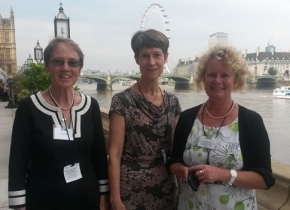 On Friday 12th June, over 100 Catch Up® trustees, trainers, supporters and friends had afternoon tea in the very elegant and historical surroundings of the Cholmondeley (pronounced Chummley) Room and Terrace in the House of Lords. We were the guests of Baroness Andrews OBE and we were celebrating 15 successful years of Catch Up® and looking forward to exciting future developments. Baroness Andrews is well known for her dedicated work in the field of education. She was founder and Director of Education Extra – the national charity for out-of-school learning and activities. We kept the speeches to a minimum (we all wanted to enjoy the delicious tea and take photos on the terrace!) but there were a few important things to be said. First of all, Baroness Andrews reminded us of the importance of working with vulnerable learners and the difference improving literacy and numeracy skills can make to the learners themselves and their whole families. Then Dee Reid gave us a whistle-stop review of Catch Up® since its launch in 1998. There were some in the room who remembered the earliest days of Catch Up®, but few of them could have imagined that we could achieve as much as we have – developing from a literacy intervention for Year 3 pupils delivered by teachers to become a literacy and numeracy intervention, delivered by teaching assistants for pupils in Years 2 – 9 and also reaching out to looked-after children, traveller children and young offenders. (and by ‘benefit’ we mean having achieved double the normal rate of progress of an average learner … which is quite an achievement, since these struggling learners weren’t even achieving average progress!). Next, Marika Mears, who is Headteacher of a Primary School in Norfolk, talked to us about Catch Up® at the chalkface – she told us about Mary, who had Catch Up® Numeracy in Year 5, and how it stopped her being so anxious about maths and gave her the space to learn new skills at a pace she could handle. Marika also told us about Mary’s mum, who says that Mary is a changed child since she started Catch Up® and that Mary’s increased confidence in Maths had benefited the whole family. Finally, Marika shared with us the experiences of two Teaching Assistants, who not only enjoyed seeing the pupils making excellent progress but also felt they had personally benefited from Catch Up® as they felt proud of the part they had played in children’s success. Finally, Julie Lawes, Catch Up® Director, explained where Catch Up® is going next – we’re not just planning on more of the same (successful though we have been); we plan to make a leap forward in our achievements with some very ambitious targets – training a further 30,000 trainees in the next 5 years and extending the support we offer schools who are already delivering Catch Up®. This can only be achieved with the support of the Social Business Trust, who have selected Catch Up® as a charity that has the potential to grow. So watch this space, because in the next 5 years, Catch Up® is really going places! Photograph shows Catch Up® co-creators Diana Bentley, Dee Reid and Suzi Clipson-Boyles.